This old fashioned accompiment to pancakes, rice pudding or ice cream is easy to make, and when finished has a subtle flavour. 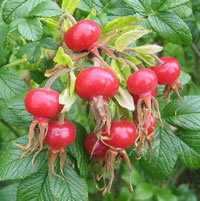 I used Rosa rugosa as the heps are so large! Crush 2lbs of the rosehips and put into 3 pints of boiling water having first rinsed, and then top and tailed them. Bring back to the boil, then remove from the heat and let the pan stand for 10 mins. Strain the pulp through a jellybag and when it ceases to drip, return the pulp to the pan with another 1½ pints boiling water. Re-boil and allow it to stand as before, then strain. Discard the pulp. Mix both extracts and pour into a clean pan. Reduce by boiling until juice measures 1½ pints. To know by how much I had to reduce the liquid, I first measured 1½ pints of water into the reducing pan, and marked where this came to on the wooden spoon handle, like a dipstick! Now add 1lb of sugar and stir over a gentle heat until the sugar dissolves. Boil for a further 5 minutes. Pour into hot sterilised bottles and seal.